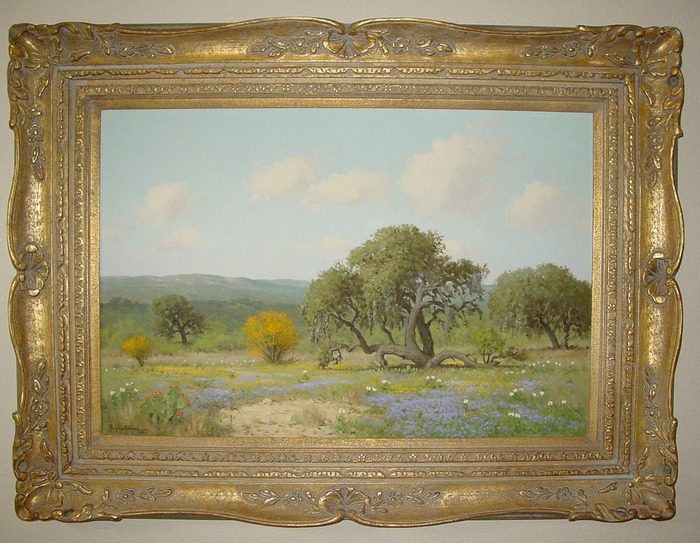 Porfirio Salinas was a self-taught artist who painted landscapes of Central Texas with an emphasis on the vast bluebonnet fields that grow there in the springtime. Born in 1910 in Bastrop, Texas, he attended public schools in San Antonio. He also observed works in progress by the director of the San Antonio Art School, Jose Arpa, as well as landscape painter, Robert Wood. 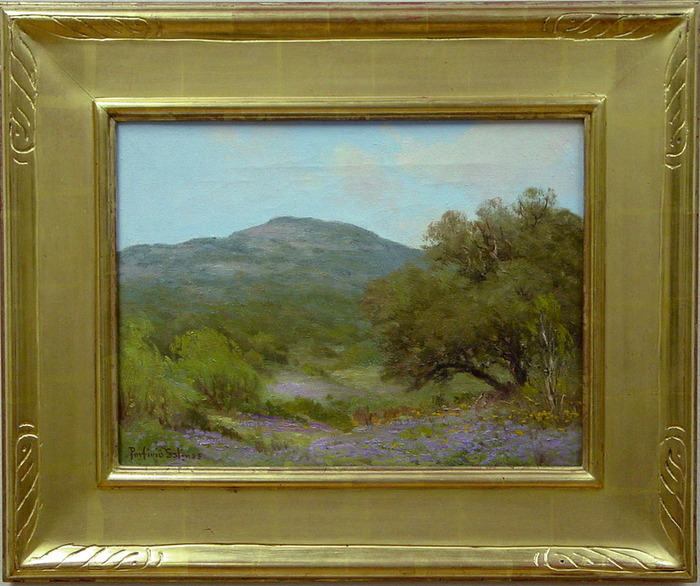 Wood is said to have paid Salinas five dollars a picture to paint bluebonnets because "he hated to paint bluebonnets". Salinas served in the military from 1943 to 1945. Although he was assigned to Fort Sam Houston, he was allowed to live at home. At the fort, Colonel Telesphor Gottchalk assigned him to paint murals for the officers lounge and various other projects, and Salinas continued to be able to paint during his entire conscripted period. Even before he achieved notoriety among galleries, dealers, and museums, Salinas was widely followed and appreciated by many Texans, including former President Lyndon B. Johnson, who may be considered responsible for launching Salinas popularity beyond the boundaries of Texas. In 1973, Texas capital, Austin, honored Salinas for having "done much to bring the culture of Mexico and Texas closer together with his paintings". Salinas died in April 1973 in San Antonio, Texas. 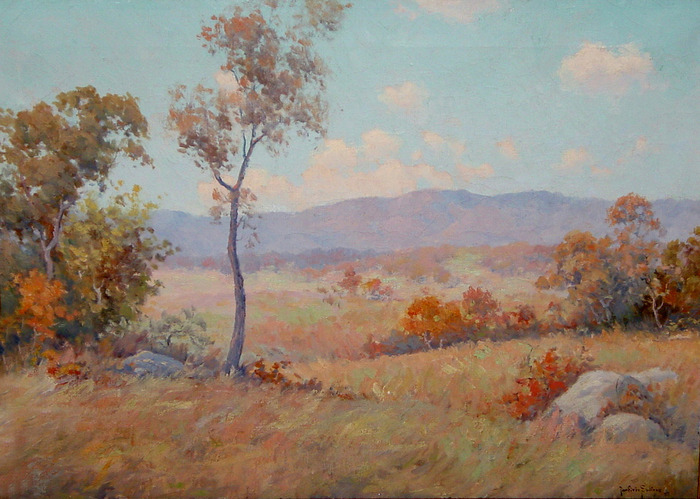 included in virtually every major private collection of Early Texas Art. the Rio Grande River, would forever remain a touchstone for the artist. Mexico to visit Clara Salinas' family. textbooks were seldom opened and whose sketchbook was never closed." career with any future for his son. young Salinas wasn't destined to be anyone's assistant for very long. selling his art and beginning to garner recognition across Texas. large Salinas paintings to the Citizen National Bank in Abilene, Texas. a controversial election that vaulted him in the United States Senate. help him manage his career. collectors. All that changed in 1961 with the election of John F.
Texan in a cowboy hat was a large part of his imposing political image. work was mentioned in Time Magazine and other national publications. remind me where I come from." have to wait for a painting. bring the culture of Mexico and Texas together with his paintings." Salinas Art Exhibition annually since 1981. A & M University and the Modern Art Museum of Fort Worth. House Press: 1975) that was based on interviews with the artist. Porfirio Salinas, Jr., painter, son of Porfirio G. Salinas and Clara G. Chávez, was born in Bastrop, Texas, on November 6, 1910. He attended the public schools of San Antonio for three years and was largely self-taught as an artist. He learned from watching José Arpa, director of the San Antonio Art School, sketch in the streets and fields of San Antonio. He also learned from Robert Wood, a prolific landscape painter, who paid him five dollars a picture to paint in bluebonnets on his canvases because "he hated to paint bluebonnets." 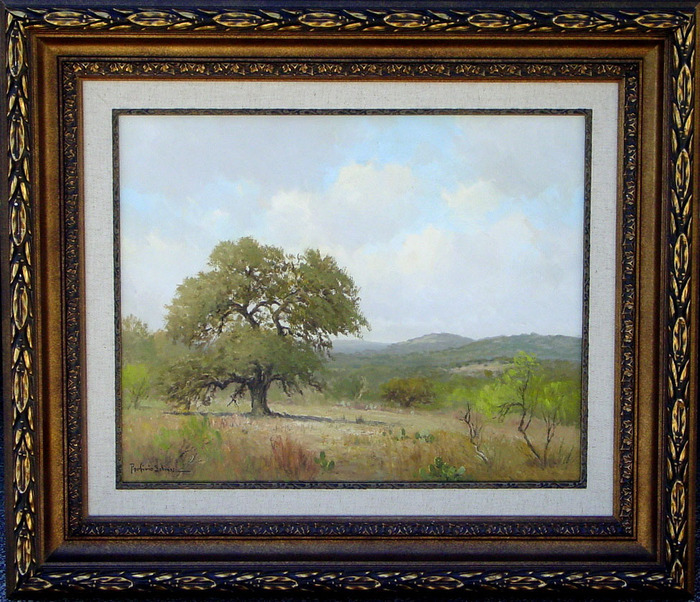 Salinas dedicated himself to painting landscapes of Central Texas with particular attention to the bluebonnets that grow in abundance in the springtime. Although Salinas did not receive the attention of the professional art establishment-art galleries and museums, and art critics and art historians-he achieved a popular following among many Texans as well as the political leaders of Texas and the United States, among them Sam Rayburn and Lyndon B. Johnson, who began to collect his work in the 1940s. The recognition of his work beyond the borders of Texas dates from Johnson's presidency. This popularity allowed Salinas to command high prices for his work. Salinas was conscripted and served in the army from October 12, 1943, to 1945. He was assigned to Fort Sam Houston in San Antonio, where he painted murals for the officers' lounge and other special assignments for Col. Telesphor G. Gottchalk, reception center commander. He was allowed to live at home, where he continued his easel painting for the entire duration of his tour of duty. He married Maria Bonillas, a native of Guadalajara, on February 15, 1942. She was working in San Antonio as a secretary at the office of the Mexican National Railways when they met. She assisted him in all his dealings with his agent, Dewey Bradford, of Austin, who was primarily responsible for selling his work. The Salinas had one child. Salinas was a Catholic. The city of Austin celebrated a Porfirio Salinas Day in 1973. The painter was honored for having "done much to bring the culture of Mexico and Texas closer together with his paintings." Salinas lived his entire life in San Antonio, where he died on April 18, 1973.